Ils sont des vraies. Ils ne parlent pas français! Even in these days of internet and cell phones it is at times still hard to find out what goes down in France. Rumor had it George W. Bush or Jacques Chirac was going to make an appearance. And sure enough what with the stands and tents being put up at Utah Beach and Sainte Mère Église and the heavy presence of the French police and army it looked like it. We left it at driving by and decided not to come back there this year. Too crowded, too 'official'. We would be in Normandy for a week, did not read the papers, did not watch tv and decided to make our little plans as we went along. And in the end I never found out which big shots did visit Normandy this June. Normandy is a beautiful part of France. With centuries old farms, small coastal villages and most of the smaller roads lined with the famous hedgerows. But what today is a tourist's delight was an infantry man's nightmare in 1944. With a possible German sniper around every corner, or a burp gun (MG-42 machine gun) covering every field he had to cross. German patrols with rat pistols (MP-40 submachine guns) everywhere. Huge casemates now derelict but once holding large guns covering the beaches can still be found and they still impress. Sixty years on, my friends and I toured the now peaceful again area in two 60 year old U.S. Army jeeps, fully restored and with all the trimmings. Armed with large scale maps of the area we 'patrolled' the hedgerow lanes around the former dropzones of the 82nd and 101st Airborne divisions. 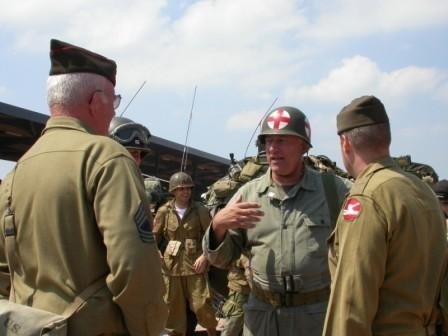 Coming across the occasional re-enactor dressed as a 1944 paratrooper and meeting other jeeps and bigger wartime U.S. Army vehicles helped to imagine what it must have been like 60 years ago. We stumbled on several 'Army tent camps' with barbed wire, sand bags and all, some with even an stern looking MP guarding the place. Just outside of Ste. Mère Église an exhibition by a longtime collector showed the actual uniforms and artefacts used by the real paratroopers. It was interesting to see a famous photograph of airborne soldiers in town and have those very uniforms displayed in a showcase next to it. Still a lot has changed in 60 years even in sleepy old Normandy. Roads that look like no more than dirt tracks in wartime pictures are now all covered with tarmac so even if you do not have a jeep at your disposal you can still get just about anywhere by normal luxury car. We preferred to travel by jeep however, and in 1944 uniforms. This way we discovered many beautiful old farms, mansions and even castles. And lo and behold we were at times welcomed as if we were the actual liberators. One time we drove by a very impressive mansion, more of a fortified house, surrounded by an enormous stone wall. We simply had to see the court yard and hesitantly drove up to the gate and entered the place. We stopped planning to explain our presence and to ask permission to take a few photos, but before we knew it the owners had us in their living room sipping cider and whiskey. And out came the stories and the pictures. The oldest reference to the house the owner had found was from around 1280 A.D.! And now the property had been in the Franquetot family for five generations. The Landlord had been born on the premises in 1938 and remembered the arrival of the Yanks well. They had around 150 German soldiers billeted there until eight days before D-Day. Fearing Cherbourg would be a very likely landing spot the German High Command had ordered the troops to go there. And suddenly the U.S. Army showed up and Eisenhower made his headquarters in the house for a couple of days. A famous photograph, which the owners had in a book signed by Ike himself, shows him, general Omar Bradley and general Collins in front of the house. Of course this was immediately re-enacted by us. Ike had good taste in choosing billets. This house really is something to behold, part of it seems to be in the Gallo-Roman style with arched windows and all. June 5th saw us watch the parachute jumpers of the current U.S. Army. They came over in C-130 Hercules Transports and jumped over La Fiere just outside Ste. Mère Église where there is still a foxhole supposedly once occupied by general James M. Gavin. The roads had been blocked for cars for the jumps and would remain blocked for the rest of the day. So after the jumps we decided to go on a hike towards La Fiere café. 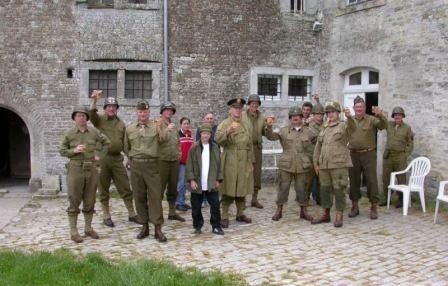 Now all week Normandy had been crawling with look a like world war 2 GI's, almost all French re-enactors. But as we were with American friends a lady decided with her husband that we had to be for real since we did not speak French. By the way this was a favorite act of us. People would come up to you and start talking in French expecting you to be a French re-enactor but we insisted we did not speak French since we were from America, for the day of course, and they were all very much impressed. All the more since we would willingly pose and hand many a 'bon bon' to French toddlers. During the hike we happened upon a great place, just across from the official stand, to watch the French air force demonstration team doing there air acrobatics. Their precision was unbelievable as if the planes were glued together. The original 3 kilometers we planned to hike doubled due to a wrong turn by our navigators but the weather was great and we had brought plenty of water. It was a real pleasure to hike the French country side, with quite a few roads named after American paratroopers, and we all had a very good day. We later linked up again with our American friends who were staying on a camp site near Omaha beach. 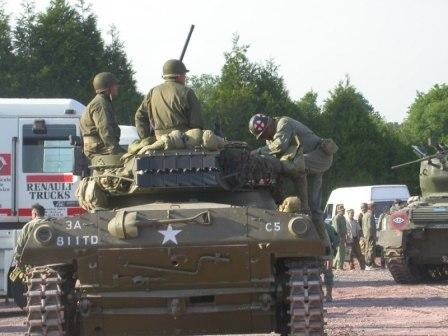 One of them, Charles Varner, being the president of the Military Vehicle Preservation Association got us into a convoy into Carentan organized for June 6. The organizers were very strict as to uniforms. These had to be either original or perfect copies of wartime issue gear. They really wanted it to look like a wartime U.S. Army armored column was rolling into town. Not a problem for us of course since all of our gear is original. Plus we copied some wartime U.S. Army rations to jazz up our jeeps. The array of vehicles was most impressive, the likes of which we won't probably see any time soon. No less than 10! tanks of world war 2 vintage were present. Shermans, Stuarts, a Hellcat and even a rare M10 Tank Destroyer. On top of that there were at least 15 armored cars: Halftracks and M8 Armored Reconnaissance cars. Plus the necessary GMC Deuce and a Half trucks and of course lots of jeeps including ours. 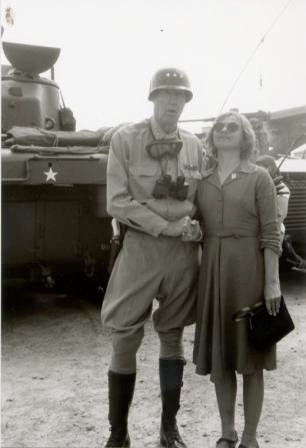 A surprise was the appearance of general George S. Patton (Mr. Art Pope) ivory handled revolvers and all. He congenially posed with just about anybody and he would take part in the convoy in his Dodge Command Car adorned with flags and stars. 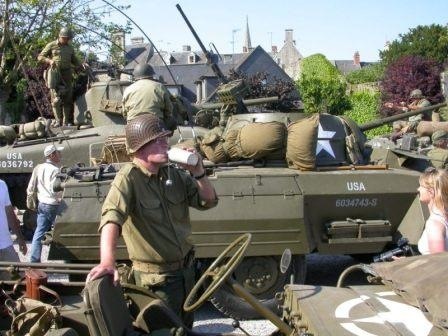 It took a while to get all the armor lined up and ready for the drive into Carentan. We were nr. 25 and 26 in the convoy and watched the Shermans start with lots of smoke and noise, shift into gear and then move out throwing up clouds of dust while tearing up the pavement with their steel tracks. After the inevitable hold up for a ceremony at a monument lost in an out of town industrial zone (after all this is France) we finally got to drive into the old town of Carentan. The sun drenched streets were lined with a cheering crowd. We threw Hershey bars, Assorted Charms and chewing gum to all the kids who could not believe their eyes. The older folks sometimes watched with a tear as they remembered, some saluted which made me feel small. All vehicles were parked on the town square and we enjoyed the visitors, the sunshine and met up with old friends. After not too long we were 'ordered' to mount our vehicles again and prepare to move out. With the crowd still cheering (for more GI hand outs, I'm sure) we rolled out of town back to the assembly area. And when that Hellcat came in I don't know which roared louder: the Hellcat or Charles Varner letting us know he had the best of times. But underneath all the fun we had we all realize these machines were serious business sixty years ago and I for one am glad we could play our part in in this fitting remembrance ceremony since I believe it is important in these times of plenty to remember that not so long ago our luxurious lifestyle was totally unimaginable to most ordinary folks. Ordinary men and women, too many of which were asked to put their often young lives on the line for the freedom we enjoy today.